I’m in good shape for this growing season with the KNF (Korean Natural Farming) applications. The FPJ (Fermented Plant Juice; explained here, along with OHN) is a beautifully thick and deep chocolate brown, sweet-smelling syrup. My only worry here is that I don’t have a lot, but I’ll be gathering a lot of the meristems of the fast growing (“hormonal”) weeds soon and making more. Wild, what? Wacky landscapes both on the up and the undersides! I added some alcohol to the juice to squash any more mold growth and closed up. Then it was time to filter the FAA (Fish Amino Acids), of which I had two batches, assembled on 5/6/2016. They had been sitting in my basement till now (so 10 month), with an air lock on them so they could off-gas (though I never smelled a thing). I had checked on them in June and found mold, but Philip Ang (on the invaluable Korean Natural Farming group on Facebook) writes that “molds are normal in FAA. there are fungi which produce protease enzymes which break down protein. the goal of FAA is to reduce proteins to amino-acids which is absorbable by plants. protein hydrolysis can be done via enzymes or acids. microbes produce enzymes to do this while we use hydrochloric acids in our stomachs to do the same. 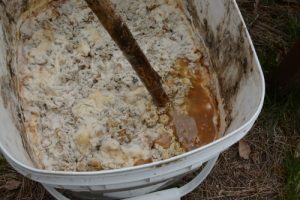 the same principle is used to produce soy sauce by fermenting with the mold aspergillus oryza.” I love that stuff! When I opened the buckets today it smelled sweet – mostly of the apples I had added, with only a whiff of sourness. When I pushed the mold on top to the side, I found an oily, syrupy juice. 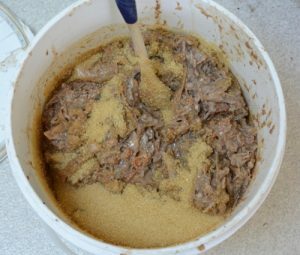 I scooped off the mold and set it aside, then strained the juice from the fish bits that hadn’t yet been dissolved and fermented. 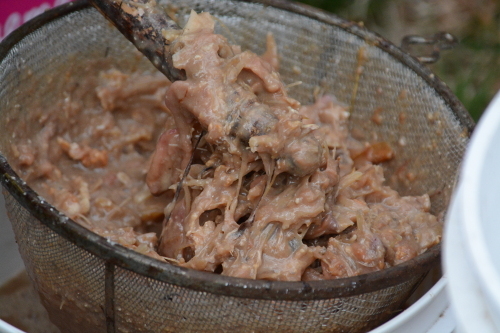 It doesn’t look appetizing, but it smelled great! When I assembled them, I did something slightly different with each batch: in one I had just put fish, brown sugar (each 29 lbs of fish, 7 lbs of sugar), and apples. In the other, I had added some water, because the slurry wasn’t wet enough, and then some kefir. The latter was not as far dissolved as the first: more, and also more recognizable fish bits, less juice. The first also yielded a greyer emulsion, the latter a more yellow one. My strainer quickly clogged up and needed frequent rinsing. 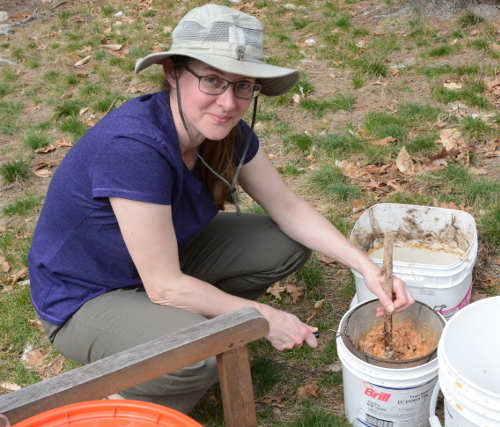 I collected the mold and the thick slurry in a new bucket, and added more brown sugar for a second round. A quick stir leave the lid open a little, and it’ll go back in my basement for a couple of months. I did most of this in the back yard. The rinse water I offered to the currants, hazels and the cherry tree. Don’t I look happy? This jar is for my ready-to-go KNF potions box. We’re ready for the growing season! Well, almost… I never did catch my IMO (Indigenous Micro Organisms) last year. I tried several times, must have wasted a pound or two of precious (imported!) rice. Having taken several Elaine Ingham “Life in the Soil” classes, I now know why I always caught the colorful and black stuff, never the white hyphae that indicate the well-established, beneficial fungi. I was trying to catch them on my own property and the neighborhood I live in is pretty recent, and it just doesn’t have the good IMOs. By the time I caught on, the weather shut that down, and we spent the entire winter with a couple of bags of wheat bran in our bedroom (didn’t want to put it in the basement or shed due to mice). This year I plan to capture IMOs in my town, about a mile from here, in an older growth forest, undisturbed for a 100 years. Let’s see what happens! 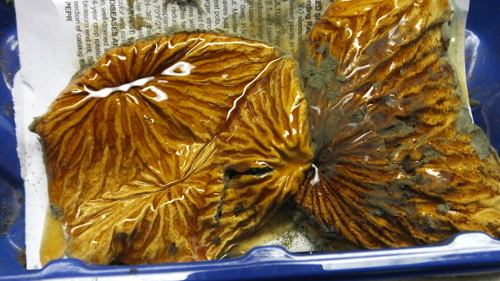 Hi: Wanted to check with you whether I found green color mold on top of my FAA. 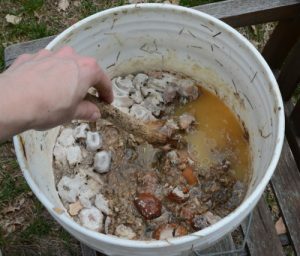 Do you know whether is it still safe for me to use my FAA after scooping the top green mold away or i should throw away my whole bucket of FAA. Hi Wendy, goodness no don’t throw it away! Just scoop off the top, chuck that, filter the rest. 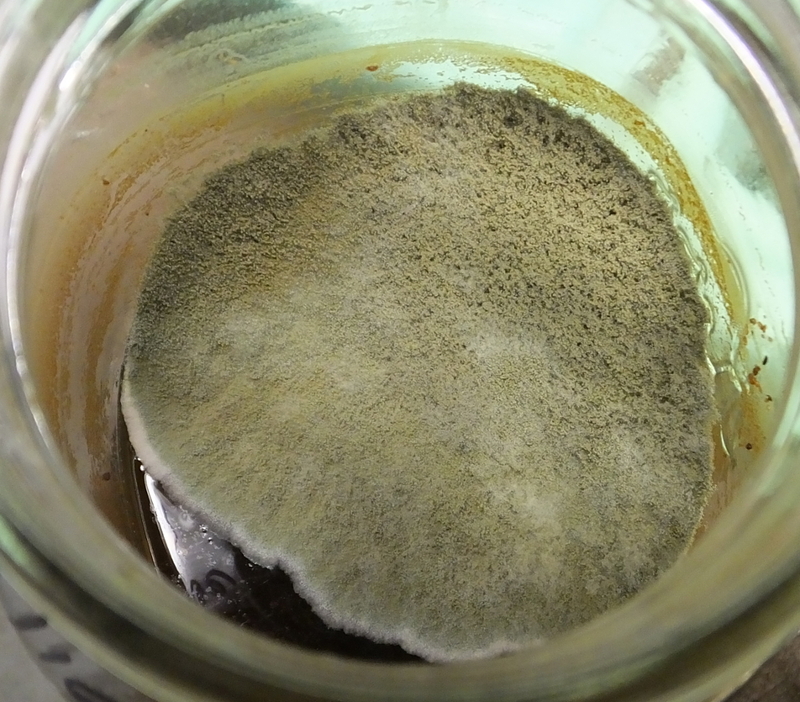 Mold might develop on top of the filtered liquid too, but it’s okay, like the rind on cheese where the anaerobic ferment meets the air. I wouldn’t *eat* it :) but the soil and the plants will be happy. Hi Kaat: Thanks for the speedy reply. I read someone said the white mold is good, but not green mold, as green mold is toxic. Hopefully filtering will help to cut down the toxic getting into the soil. 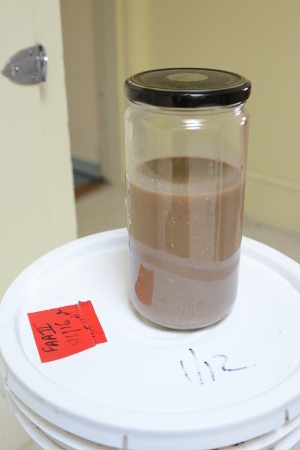 Did your soil ever turn moldy?